The King and I tickets at Opera House, Manchester. 2019. 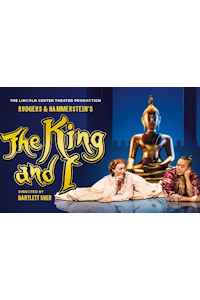 Find the best The King and I musical tickets at Opera House, Manchester. The 1951 classic is based on a diary, entitled Anna and the King, which tells the story of young Westerner Anna Leonowens who is brought to the court of the king of Siam to become the tutor for his children. The musical, which was made into a film starring Deborah Kerr and Yul Brynner in 1956, features several classic songs including "Shall We Dance", "Getting to Know You", "Hello Young Lovers" and "I Whistle a Happy Tune". Friday, 26th April 2019 to Saturday, 11th May 2019.